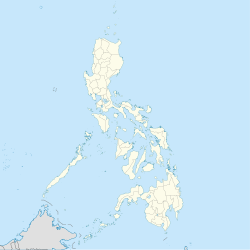 Sultan sa Barongis, officially the Municipality of Sultan sa Barongis, is a 2nd class municipality in the province of Maguindanao, Philippines. According to the 2015 census, it has a population of 22,425 people. It is formerly known as Lambayong. In 2004, 11 barangays of Sultan sa Barongis were transferred to the newly created municipality of Rajah Buayan, Maguindanao, reducing the number of barangays from 23 to 12. ^ National Statistical Coordination Board (2004-10-25). "2004 Factsheet (August 1-September 30, 2004)". Archived from the original on September 16, 2006. Retrieved 2006-06-24. ^ "Sultan sa Barongis, Maguindanao : Average Temperatures and Rainfall". Meteoblue. Retrieved 19 January 2019.